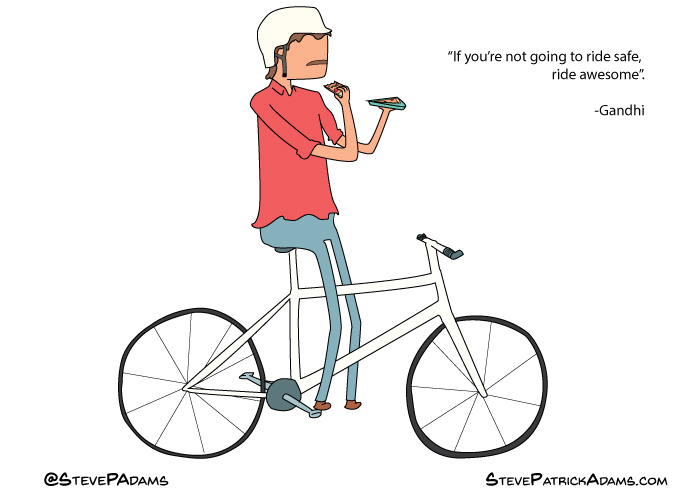 When I was about five, I witnessed one of the most incredible feats accomplished by any individual ever: a man riding his bicycle while eating two hot dogs at the same time. The image stuck with me throughout my life and has always been the most pointless accomplishment I wished to achieve. A couple nights ago I found myself with a slice of pizza, a bike, and a short trip home. The man with the hot dogs came to mind and I worked up the courage to ride my bicycle down my street while eating the pizza. It felt more profound than many actually important things I had done in my life and so I wanted to share that experience with others via this self portrait. With a helmet on though? Double hot dog man would laugh right in your safety-valuing face. He most certainly is not but I’m sure he’s smiling on us, whilst eating two hot dogs in heaven. I think your seat height is too low….